Contains vital nutrients that are the perfect complement to Shen Min hair vitamins. 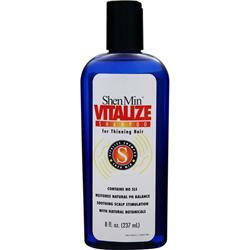 Vitalize Shampoo conditions and energizes your scalp and hair shaft to improve the appearance of thinning hair. The formula contains botanical extracts that cleanse the scalp while nourishing the follicles to help hair achieve maximum thickness, density and length naturally. We use only the highest quality ingredients to make it safe for chemically sensitive individuals and anyone who wants lustrous, healthy hair. No alcohol. Not tested on animals. Water, Sodium Laureth Sulfate, Aloe Barbadensis Leaf Juice, Disodium Cocoamphodiacetate, Lauryl Glucoside, Decyl Glucoside, Sodium PEG-7 Olive Oil Carboxylate, Dimethyl Sulfone (MSM), Glycerin, Hydrolyzed Wheat Protein, Oat Kernal (Avena Sativa) Extract, Rosemary Oil, Potassium Chloride, PEG-400, Sodium Citrate, Citric Acid, Diazolidinyl Urea and Iodopropynyl Butylcarbamate, Fragrance. Wet hair thoroughly and apply shampoo. Lather and rinse. Repeat as necessary. For external use only. Avoid contact with eyes. Discontinue use immediately if rash, irritation or discomfort develops. Consult your physician if irritation persists. Keep out of reach of children.